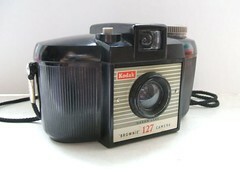 The Brownie 127 was, in the UK, an extremely popular plastic snapshot viewfinder model for 127 film made in England by Kodak Ltd. From introduction in 1952, over a million had been made by August 1954, and the series continued to sell many more millions. A few (~263,000) of the first model were exported to the US in 1953-4, where they were badged Brownie Starlet - and should not be confused with the more common Brownie Starlet. The first version of the camera was made of a black Bakelite-type plastic and had a rounded shape, where the film carrier mechanism and viewfinder were attached to the top of the camera, which lifted out the base. The base carried the lens and shutter. The sides were stepped, and there were steps beside the viewfinder tube. The second version had vertical lines on the sides and a flatter top. There were many small changes of faceplate and detailing; some had cream controls, later models having grey. An experimental white version, with a silver top, was made and only sold in Jersey in the Channel Islands - in c.1959; it was not successful, as the colour dirtied very easily. This rare variant is frequently faked by painting black ones. The third version of the camera was made of grey plastic and completely reshaped to have flat sides, angled corners, and square, 4x4cm images. The shutter speed and lens aperture were fixed; the only controls were wind-on and shutter release. 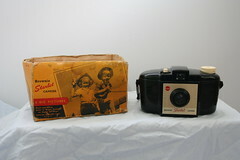 The shutter had double-exposure prevention and flash sync, and a shoe for a special Kodak flash-holder (introduced for the Instamatic range) was added to the top. The shutter release was a large white square on the front, beside the viewfinder. The Brownie Cresta was a similar camera, but made larger (for 120 film) and with a close-focus setting, and some angles introduced.